Home » Features » The 12 Old-School UK Death Metal Albums You Have To Hear! 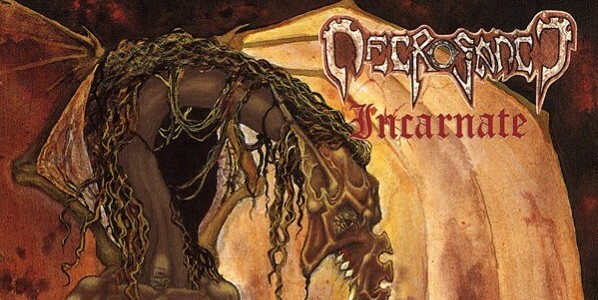 Proof that the UK did have bands that could deliver the filthiest sound of purist evil imaginable, Necrosanct’s Incarnate still sounds shockingly abrasive today. Veering dangerously close to total pandemonium, Necrosanct fashioned a death metal album that made up in violence what it lacked in finesse. Brutal, in the strongest sense of the word, and designed for those who feasted on the sounds of hell made flesh, Incarnate is possibly the most timeless album on this list, as ferocious and unpredictable now as it was in 1992. There’s something so utterly unhinged about the Martin Van Dunen (Pestilence) meets John Tardy (Obituary) vocals that sends Incarnate rushing headlong into the realms of madness. Somehow, frontman Ant Ryan managed to take the tonality of Van Drunen and the unintelligible nature of Tardy’s animalistic gurgles and vomit up something even more disturbing. The result,when layered over Necrosanct’s blurred riffing, was nothing less than hell incarnate. Put down your Entombed, Dismember, Grave & Unleashed albums.....and listen to these instead! Take a dive into the gutter!! !